So, you just found out that the titles of your web pages aren’t aligned to search engine optimization and therefore, you are missing out on great traffic. Bad news: Making the most of unique titles on each of your web pages is one of the most important factors in getting found on the search engines like Google AND getting a click through -so you’ve really been holding your website back. Good news: Title tags are easy to adjust and once you get the hang of it, you can dominate your competition. Well, title tags define the theme of any webpage. Like the title of a movie, or the headline of a newspaper story, a website title tag is the HTML title that describes the topic of an online document. It helps the search engine locate the material the searcher seeks with keywords found inside your title. Think of titles as book covers- they give the reader a clue about the theme and entice the reader from a shelf of books- pick me! Pick me! Unlike books, title tags don’t have the advantage of color or design to grab the eye- just one line of text. 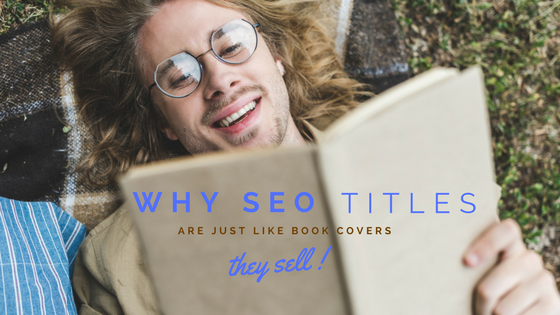 And titles have two audiences to please: the search engine AND the searcher! Titles are HTML for the search engines who rely on title tags to decipher the content of a page and determine the page’s subject matter to deliver relevant website choices to the people who make search requests. And when the search engine (like Google) delivers choices to the person requesting a search, those choices are links which will carry searchers to websites. Those links are the TITLE text. So then, where do you find these title tags? There are three places that you’ll see a web page title tag so let’s cover them from most visible to least visible. While title tags don’t display on the webpages themselves, title tags make up the boldest feature of the SERP. When you google a phrase, the entry blocks delivered back to you make up the SERP. The title tag of each page delivered creates the headline of the SERP. 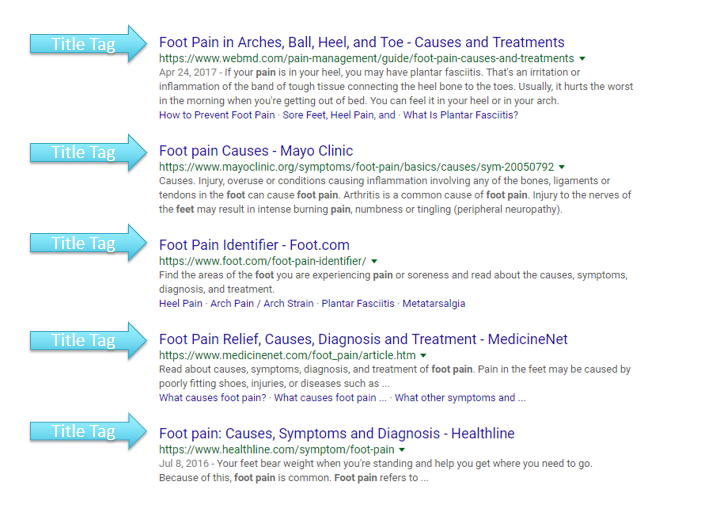 Imagine you searched “foot pain” in the google search and these entries were delivered to you. 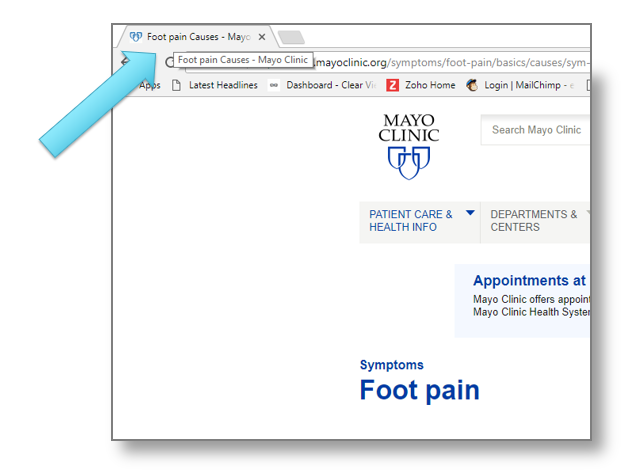 Note: if a podiatrist wants to be seen here, the site had better include a page in which “foot pain” in a prominent title. Now, as a searcher, which entry would you have clicked on? Your decision is incredibly influenced by the title tag. Are you interested in the cause of foot pain, the diagnosis, or the treatments? Do you want to see results from the Mayo Clinic, Medicine.net, or an unknown source? The title tag appears as the top tab of the webpage in the internet browser. Notice the browser tab includes the title tag and upon hovering the mouse over the tab, the call-out box displays the entire title. Not much is done with these tab entries. The <title> marks the beginning and end of the title and you’ll find the title of the page in between. How do the title tags work? First, it’s essentially how the search engine finds you. No matter the algorithms that a search engine uses, title tags are still the easiest way to determine the topic and relevancy of a page. It’s a valuable part of on-page SEO. Second, the title tag forms the clickable link in the search engine entry page so how you say your keywords is important in the race to intrigue the person who is choosing the next click. Why do so many websites have missing or ineffective HTML title tags? Interestingly, it requires a few different skillsets to organize title tags. You need someone technical enough to know where to put them (like a developer) and a marketing writer who knows how to get people to click on SERPs. And an SEO strategist determines the keywords so that Google will offer your page under the right combination of words. Plus, you must squeeze your title down to an engaging but terse 30-55 characters! But once you get the hang of it, titles (and meta descriptions) are a SERP super-power driving tons of traffic. 1. Map one keyword (or long-tail phrase) to every single web page. Each tag should include relevant and strong keywords, but limit them per title. You don’t want to wander off on your title tag and post irrelevant information that may turn the searcher away, or cast a net that’s too wide thus hurting your chances of the search engine finding your page to be relevant and on topic. 3. Search the keyword you’ve chosen and see what competitors have used as their titles and then make yours the clear enticing choice. Be a salesperson here. Your title tag is the searcher’s first impression with your page and in some cases with your brand. You want to sell your page as being the best possible page for the searcher to click. If given the following options, which would you click on? New Clothing | Fashion Inc.
5 Fashion Trends + rewards | Fashion Inc.
4. Limit your total title to 30-55 characters. 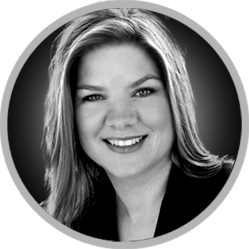 The best part about title tags is that they have tremendous impact for little work, meaning huge ROI. Start mapping your title tags using these 5 rules and you’ll be on your way to better optimization. Contact us for a free website analysis (value $249) for a score on your website’s title tags. We can show you what’s already right and what to fix for the biggest boost.